The HAY BALER® is a heavy duty, heavyweight dummy designed to be thrown, pressed, squatted or carried to develop strength, power and overall conditioning. The primary application is to improve triple extension and build rotary power. The secondary applications allow you to do a metabolic conditioning routine relevant to your sport. 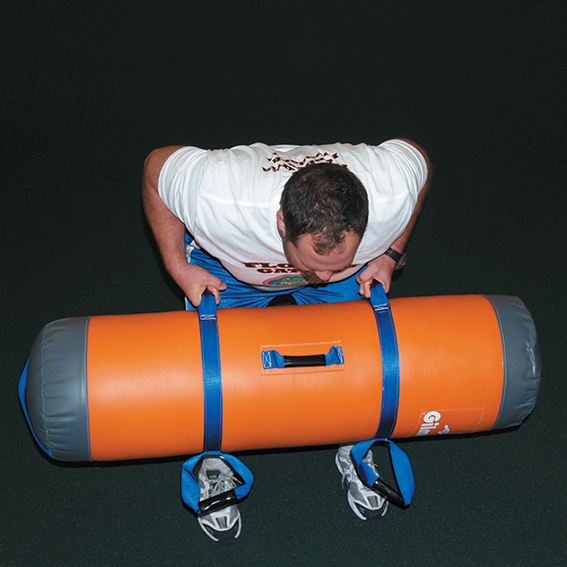 This multi-functional piece of resistance equipment gives you another tool for your training program. A Hay Baler® workout includes the following exercises: • Hammer Throw • Caber Toss • Twist • Duck Walk • Fireman’s Carry • Clean, Press & Toss • Bent-Over Row • Lunge & Squat Available in five different weights: 35 lbs, 50 lbs, 75 lbs, 100 lbs, and 125 lbs. Molded urethane foam core. Will never lose its shape! Four different handle locations allow the bag to be held in a vertical or horizontal position. "The coaching point is to implement non-traditional workout tools that are fun, safe and confidence building!"